This delicate and floral dark is made from pure white “Porcelana” beans, recently rediscovered in the foothills of the Peruvian Andes. 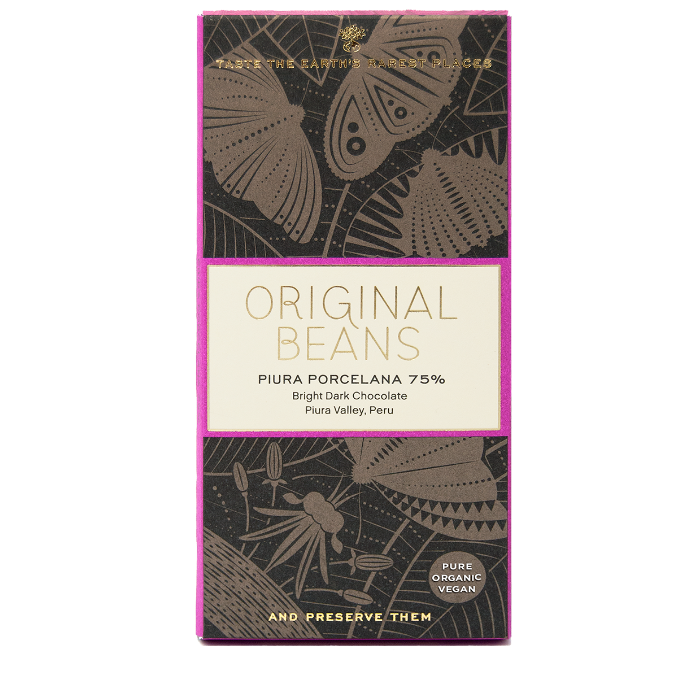 Original Beans collaborated with local farmers to bring it back into production and produce this vibrant, and intense chocolate with roasted and fruity flavour notes. This chocolate doesn’t just taste great, but every time Original Beans sells a bar, it plants a tree in the rainforest. Phillip Kauffmann, the founder of Original Beans was previously at the WWF – and sees this as a continuation of his work. Eat a bar, and save the rainforest! Classic brown colour, although quite bright as you'd expect from Piura Porcelana. Strong on the nose, sweet with a hint of tobacco. Strong taste, starts with a strong almond and a hint of raspberry, then mellows down towards the finish. Absolutely delicious! Best of the Piura Porcelena cacao bars I have tried so far. Exceptionally silky. I can certainly taste the lime and toasted pecan notes, a good intense dark chocolate that isn't too bitter.